Why did the ‘turkey’ cross the road? Well if it’s November and the road is the Vestal Parkway, it’s because some very special people cared enough to cross with a turkey and fixins’ to brighten the Thanksgiving holiday for those in need. Once again this year, an intrepid pair of radio personalities from Clear Channel 103.3FM spent a week in a motor home (courtesy of Wilkins Motor Homes) right outside the Walmart store in the Vestal Town Square Plaza to broadcast this year’s goal of 4,000 turkeys. Between the Christmas music, they encouraged donations and met and greeted the generous people who came by to contribute a turkey or a monetary donation. During the week-long drive, the growing numbers of turkeys were kept at a cozy zero degrees in an on-site freezer truck, which was provided by Willow Run Foods. Then on Friday November 22nd, Catholic Charities’ staff and volunteers, along with volunteers from area parishes and organizations, began the process of distributing the turkeys, which would be enjoyed by over 7,000 individuals. The Turkey Drive is a wonderful expression of community spirit. Individuals, families, organizations, and businesses pitch in to ensure that everyone has a place at the table. It is inspiring to see individuals and families that received help in past years returning with donation to help others. 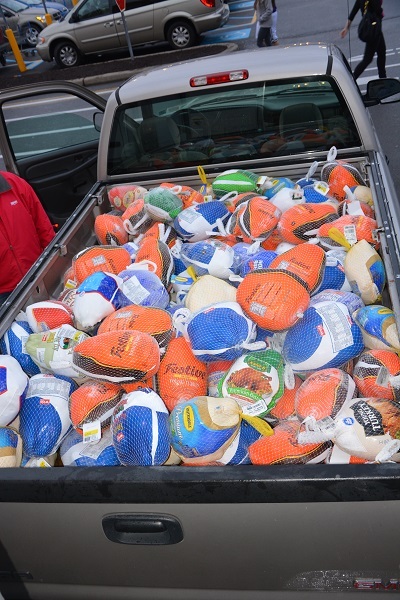 We wish to thank all those who helped make the 2013 Thanksgiving Turkey Drive a success. They include Lori Martin-Carson and Matt Gapske from Clear Channel, the Binghamton Senators, Fidelis Care, Willow Run Food, Hillcrest RV, Tioga Downs, Walmart, Catholic Charities staff and volunteers, the Boy Scouts, NYS DMV Commissioner Barbara Fiala, Broome County Legislator Anthony Fiala, area parishes, and all the community and sponsors who contributed turkeys, food and donations.